I was reading another great post by Ragen about negative body talk and, as usual, enjoying seeing other people’s thoughts and ideas on the post via the comments. One person’s comment really stood out to me, as it seamed to be very accusatory toward women about the issue. Making it almost sound like it is just women’s fault that they engage in negative body talk and have made it such a prevalent issue. I think it’s important to remember that the cultural phenomenon of negative body talk doesn’t just happen in a vacuum. Most women who engage in negative body talk have become victims of a culture that treats women as though their bodies are not their own. We are bombarded daily by messages in the media that are proof of our cultural ideal that women are here for others to enjoy, and that it’s totally ok to judge their bodies as such. I think it might be tempting to assume that it’s women’s fault for all this “negative body talk” or that it’s “mostly other women who come out with endless negative body talk” because of it’s more apparent and “in your face” when women do it. But if you frequent any of the sites and forums dedicated to men, you’ll also see a lot of “negative body talk” directed AT women BY MEN. Our culture teaches people that women’s bodies are there for the public consumption (“eye candy”) and that it’s totally ok to view women’s body’s as objects to be picked apart, talked about, and judged. It’s not just women who engage in the native body talk about their bodies, but men do it too …about women’s bodies. They may not be as public and open about it, but it’s insidious and it’s definitely prevalent. Until we can change the cultural thinking that women’s bodies are not really our own or that we are here as eye candy or for the enjoyment of other people, we can’t just label this a “woman’s issue” and point fingers there. This isn’t just a woman’s issue, this is a deep seeded societal issue. It affects all genders and all ages and effects nearly every person who is daily exposed to our culture. It’s not giving the issue the scrutiny it needs to label it a “woman’s issue”. Body policing, disgusted stares at “unattractive” women, pointed comments about “frumpy” women, commenting on women’s body sizes, pointing out when someone happens to have lost weight or gained weight, it’s all part of the current cultural phenomenon that it’s ok to objectify women’s bodies and to treat them as something to be judged. How often do we, ourselves, engage in such destructive and lookist ways of treating women? How often do we look sideways at someone dressed in a way that we might think is “inappropriate”, how often have we told someone we care about that they would “look better” wearing X, Y, or Z, how often have we talked about other women in a disapproving or disparaging way in regard to how they look, dress, fix their hair, wear their makeup (or “lack of”), wear their jewelry, wear their tattoos, etc? 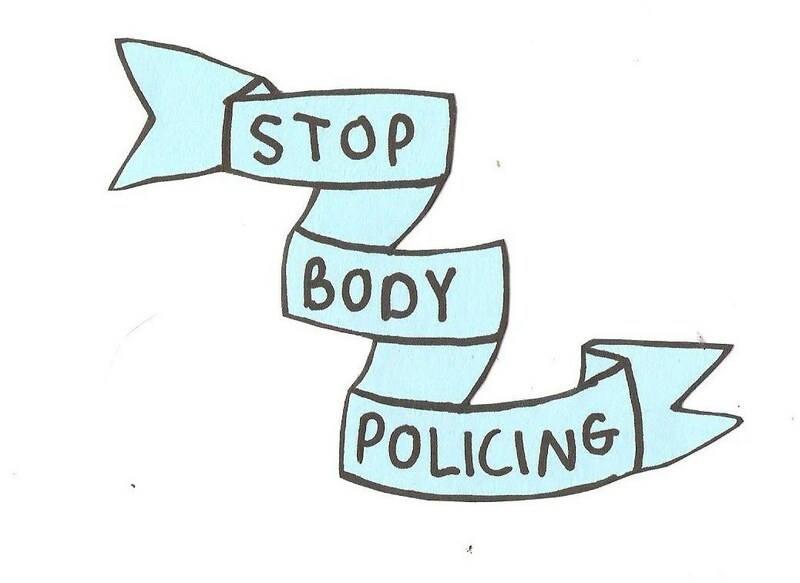 The next time you or someone you know engages in body policing, I hope you take a moment to step back. Step back and realize what kind of a message you’re sending out, and what kind of cultural ideals about women you are enabling and supporting. One of my favorite quotes by Mahatma Gandhi states simply “Be the change that you wish to see in the world.” It’s my goal to be damned sure that I become more conscious of my own words and behaviors toward others. That change that I wish to see, in myself and in the world around me, it all starts with me. Some days I may stumble, some days I may fall and fail miserably, in a world that teaches us to judge ourselves and other women, it’s only natural that some days will be easier than others. But every time I fall I’m going to get right back up again and keep moving forward. I WILL BE the change that I wish to see in the world.